Welcome to the final part of our series on organic tropical fruit. Mango is increasing in popularity as more retail markets carry the whole fruit and create interest by adding signage with the variety and country of origin. It is thought that there are over a thousand varieties of mangoes in the world, but about 20 varieties are commonly eaten. Mangoes provide vitamins A and C and fiber. Conventionally grown and processed mangoes are often treated with preservatives, synthetic fertilizers and insecticides. In the conventional industry, calcium carbide and acetylene can be used to artificially ripen mangoes; this can cause serious health problems. The use of such artificial agents are not allowed in the organic industry. In organic production nutrients are added to the soil by a variety of means such as growing plant cover on the orchard floor, mowing to create mulch, using other plant waste for compost and sometimes using vermicomposting (compost generated by worms). Organically managed mango orchards employ a variety of techniques to control pests. These include emphasis on maintaining healthy trees (which come from healthy soil), canopy management/pruning to open structure and allow good air flow and promoting biodiversity to encourage beneficial predators. 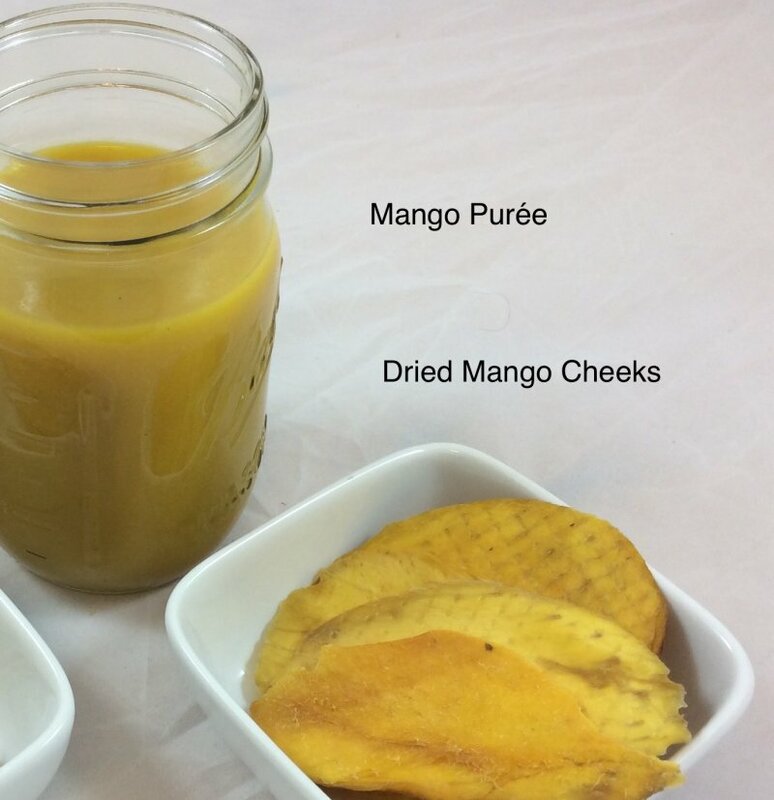 Some of our organic mango ingredients come from a processor in Ecuador that decided to focus on dehydrated products. They are near to completing a biomass project that would allow their dehydration facility to be powered by a combination of diesel and biomass (palm oil waste). This new system will allow them to become certified as carbon neutral. Their processing facility employs 80% women; many of them are single mothers. The company has “mothers” hours so workers can be home in time to greet their children after school. They are also looking into offering onsite after-school programs. Our partner purchases organic mango from several organic associations located in the western region of Ecuador. Many of these farms are working towards fair trade certification. Conventional farmers use a lot of chemicals to get “perfect” mangoes for the fresh fruit market. Organic fruit can often look imperfect due to avoidance of agricultural chemicals. This processor purchases “seconds” or imperfect fruit as they work well for dried products and are in keeping with the company’s values of operating sustainably. Any waste is used as animal feed so no part of the mango goes unused. To learn more about organic mango ingredients, please contact your Global Organics Account Manager or email info@global-organics.com.